New Aston Villa boss Paul Lambert has pledged to excite the club's supporters with his team's performances. Lambert is confident he will deal with the level of expectation that comes with the job. The former Norwich boss succeeds fellow Scot Alex McLeish, who was sacked after Villa finished only two points above the Premier League relegation zone. Lambert, who was presented to the media at a news conference on Wednesday, revealed he had spoken to ex-Villa boss Martin O'Neill before taking over. Lambert expressed his pride at being handed the Villa reins and cannot wait to get started in the role. He said: 'I have to get into it and see what is going to happen. I'm honoured to be manager of the football club. I will give it everything I've got to be successful. McLeish was dismissed the day after the final match of the season, and former Manchester United striker Ole Gunnar Solskjaer held talks with Villa about the vacancy before deciding to stay as coach at Norwegian side Molde. 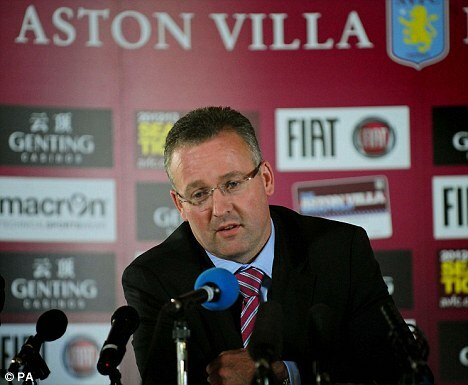 But Villa chief executive Paul Faulkner insisted the club are delighted to have recruited Lambert.